We offer our “Signs of Spring” a series of guided paddling trips on select Saturdays from April through June. This guided paddling trip balances nature observation with the quiet relaxation of a morning river outing. Departing at 10 am (you must arrive by 9:15 am) from Headwaters, each canoe trip includes all paddling gear, river shuttle, and guide service. Snacks and drinks are available for sale at the shop, food trucks available on select Saturday's (call 828-877-3106 to ask availability). Prior canoeing experience is helpful, but not necessary. Reservations are required and are secured with a 50% deposit. The cost is $60 per person, though kids under 10 who sit in the middle of the canoe cost only $30. Little Sweet Betsy (Trillium Cuneatum) is just one species found along the French Broad River during Headwaters’ Signs of Spring guided canoe trip. There are over 2,500 species of wildflowers and flowering shrubs in the southern Appalachians, and many of these can be found somewhere along the French Broad River watershed. 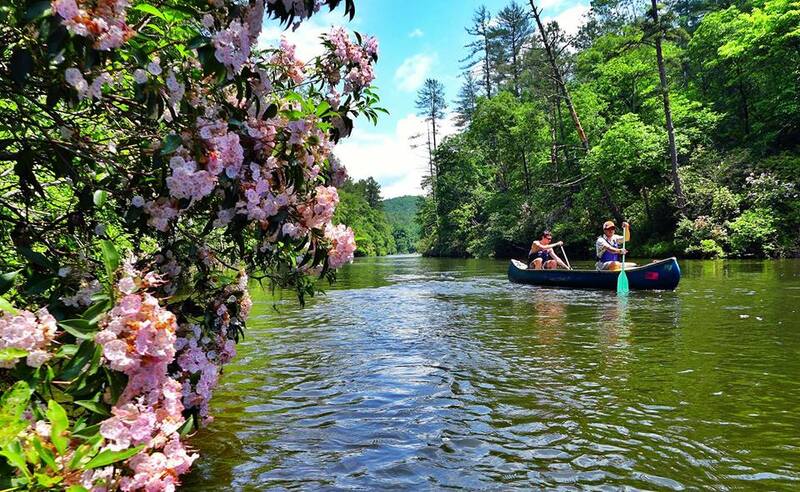 Thanks to a variety of micro-climates and abundant rainfall, the French Broad hosts a beautiful array of spring flowers. The “Signs of Spring” guided trip takes full advantage of this display.